These types of questions have no right or wrong answers. An avid fighter in the battledome would likely value high stats, whereas a trader would value a pet with a nice name and colour. Maybe you value high intelligence, a pretty name, or even how the pet would look customized. The thing is, Neopets are valued different by different people. However, most neopets are valued by their 'rarity'. Neopians 'classify' their pets with many different terms. Very well named, well named, decently named, badly named, very badly named, cheaply painted, highly painted, and basic are just some of the many labels that Neopets are given. But have you ever thought of value-true value- as something more than a label? One day I decided to visit the Neopian pound, with the intent of picking up a nicely coloured pet that could trade well. I walked past tons of pets, no of them having that 'rarity' factor I was looking for. Poor pets, I thought to myself. Hopefully someone would come along and give them the home they deserved. Then a pet crossed my eye. A green Grarrl, sitting alone in a corner, staring at me with his huge eyes. I could tell by the look on his face that he had been in the pound for a while. Immediately, my brain classified him. Basic. Not that well named. But, there was something about him that stood out to me, and in my heart I knew he was the right pet. I walked over to him, and brought him over to the adoption desk. the king Pink Uni handed me some forms. "Please fill these out," she said sweetly. I signed the adoption forms and took home Tyrannosaure. It didn't take me long to realize that adopting Tyrannousaure was definitely a good choice. As we travelled back to my Neohome to Mystery Island, he told me about all his adventures. He definitely seemed adventurous, a trait I love in my Neopets. He said he loved hunting for treasure. He said that, in the pound, he had managed to find some treasures hidden in his room. Sure, maybe it had just been a spoon, but it had been treasure enough for him. He also went on and on about how much he wanted to visit Krawk Island. He told me that place was chock full of treasure. Before he came to the pound, he had read quite a few books, his favourite about how to survive in the jungle. He said that one day, he hoped to of to the jungle so he could use some of the skills he learnt. I just smiled, and listened to all his tales. I was so happy I could give him the loving home he deserved, and swore I would never abandon him. Ever. Tyrannousaure got along really well with the rest of my Neofamily. My mutant Flotsam, mutant Meerca, and baby Scorchio gave him a warm welcome. I took the whole neofamily exploring. We visited Krawk Island, searched for lots treasure, and celebrated. On the way back home, I thought about value. I realized that value is much, much bigger than a generic label, or the expense of a pet's colour. Of course, that's my opinion. If I asked, for example, the Pound Chat (on the Neoboards)'s opinion of Tyrannosaure, I'm sure people would tell me that he's honestly not worth anything, and that I should pound him and find a better pet. They would probably tell me that Grarrls in general aren't a very loved neopets. Besides, he has a really long name, and he's not even painted a CHEAP colour. He doesn't have nice stats. I bet people would say, 'Ya. I saw him in the pound but didn't even consider adopting him." That's why I'm not even GOING to ask the Pound Chat what they think of Tyrannosaure. Why does it matter what they think? Also, I don't need insults thrown at my pets. I'm sure there would be some people, some people who think of value in the way that I do, would compliment Tyrannosaure. Maybe even more than some people. There are always those kind people who say, 'remember to adopt the unpainted pets, they have feelings too." There are people who feel bad for all the badly named, unpainted pets in the pound, who may never get to experience what it's like to have a loving home. I'm certainly one of those people. So, what is value? Definitely not a label. As I said, value is different to everybody. Sure, not everyone would value a green Grarrl as much as I do. Maybe some people value pets with nice names... not because of their label as 'Very Well Named', but for personal reasons. Maybe some people value Draiks or Krawks. Not because of their high rarity levels, but maybe because they like drawing them, or they have sentimental value. Maybe you value baby neopets. Again, not because of their expensive paint, but maybe because you think they're just so cute. The true meaning of value may be different for everyone, but, in the end, it comes from the heart. I hope that reading this has made you reconsider the value of any given Neopet. Sure, maybe someday Tyrannosaure will be painted some elusive colour, or maybe even turned into a battledome master. But, to me, that wouldn't change his value. 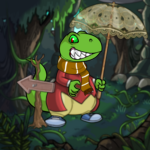 Because even as a green Grarrl, I value him as much as one would a Very Well Named Darigan Draik. So, next time you visit the pound, or think about value, don't just give every pet you see a label. Because the true value of a pet comes from your heart. A Guide to Freaky Factory: Working for Krelufun Ind. So, Krelufun Industries has seen it fit to hire you, eh? The job assigned to you here is to produce Neopets miniatures for the company, and you better do it quickly!